Ok, so I guess I've been wallowing in bleak thoughts. Not anything you'd really want to read, trust me. Dalton has been in Europe for the past 7 days. He's chaperone for a school trip to Rome and France and I miss him terribly. His plane gets in tomorrow afternoon, and not a moment too soon. I've been eating my way through loneliness and have gained 5 lbs. in a week. Not good. 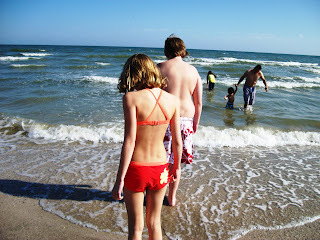 On a bright note, I took my two youngest, Joseph - 12 and Savannah - 9, on a mini-vacation to Galveston. 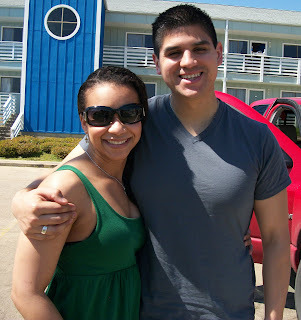 It was our first trip together, ever. And it was wonderful! On the first day, we arrived kind of late, so we just went to the store and bought snacks and things for lunch the next day and watched a movie in the hotel. Savannah was especially excited because she'd never stayed in a hotel before. Joe had been on vacation with my sister and her family, so he was an old hand at it. 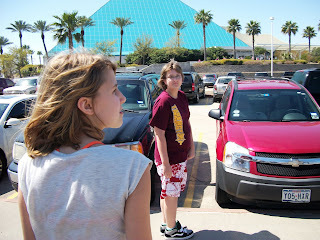 The next morning we went to Schlitterbahn, an indoor waterpark complete with waterslides, floating river with waves, and all kinds of fun things to do. 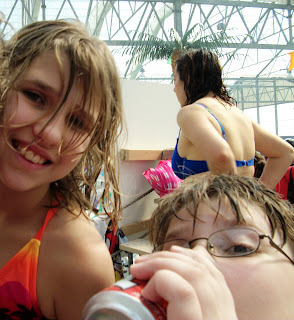 My favorite was the waterslides. You sit on an innertube-type float, poised at the top of a twirly, whirly pipeline into oblivion and a cute lifeguard shoves you off into the void. Then you're sliding down an enclosed, slippery slide, pushed along by water and gravity, and for a few brief moments you're given over to complete freedom. Swirling down a water chute, tossed back and forth in long gliding swoops, splashing and laughing and whooping out loud every once in a while when an unexpected dip takes your breath and makes your stomach drop out. Until you see the light at the end of the tunnel and it spits you out into the bright sunshine and all you want to do is get right back in line to do it again. I loved it. The kids had a great time, too. We stayed most of the day and then dragged back to the hotel, exhausted. 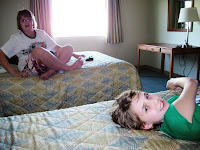 We watched another movie and thought we were settled in for the night, right up until Joe talked us into trying out the mini-golf course downstairs. Yes, we got up, got dressed, and played putt-putt at 9 o'clock in the evening. And it was pretty cold and windy. Savannah made the only hole-in-one, but I did pretty well for an old lady. Joe beat us both, of course. The next day was our last on the island. 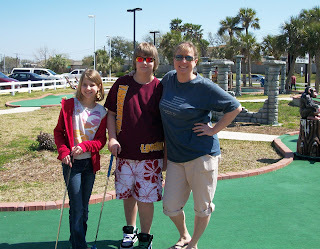 We met up with my niece, T'Noya and her husband, John, for brunch, after some more putt-putt golf! T'Noya is a marine biologist works at the Moddy Gardens Aquarium, so she scored us tickets. 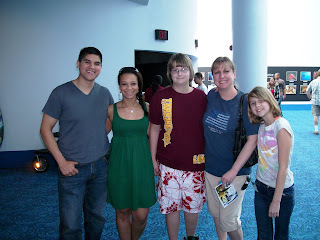 We had a wonderful meal and Joseph, Savannah and I enjoyed the exhibits at the aquarium. on an island and miss going to the beach. So, exhausted and slightly chilled, we hit the seawall. 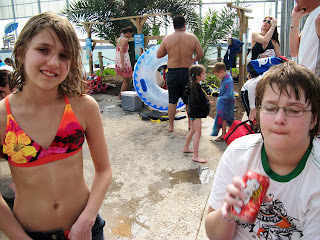 I was mightily vindicated when my kids stuck one foot in the water and decided Momma was right. It was too cold for the beach. So that's about it. We headed home, stopped for a quick visit with my very pregnant daughter-in-law, Ali, and my mom, and made it back right after dark. It was great. I really have to figure out a way to make money so I can do this more often. Before they're too cool to hang out with their mom.